OFFICIAL RULES TO WINNING THE LEXUS: Updated September 5th, 2018. The referred agent must be confirmed by HomeSmart's Career Services Team and confirmed license change to ICARE Realty with the California Department of Real Estate. The referring agent will still get $200 referral bonus. Record and share a video on social media about why you joined HomeSmart to encourage others to contact you about this innovative real estate company. Call agents you've worked with previously whom you enjoyed working with, let them know HomeSmart is hiring. ENTRY PERIOD: HomeSmart Lexus Giveaway Sweepstakes begins at 6:00 PM Pacific Time (“PT”) on August 16th, 2018 and ends at 4:59:59 PM PT on Friday, December 13th, 2019. All entries must be received by 4:59:59 PM PT on Friday, December 13th, 2019. ELIGIBILITY: This Sweepstakes is open only to HomeSmart ICARE Realty REALTORS® licensed with the California Department of Real Estate with no outstanding balance with HomeSmart ICARE Realty. Must be 18 years and older. Only individuals may enter; no entry from any corporation or other entity shall be accepted. This Sweepstakes is VOID outside of the Eligibility Area and where otherwise taxed, prohibited or restricted. Employees and Directors of HomeSmart ICARE Realty, Next Level Escrow, and their affiliates, and their immediate families (defined as spouse, child, sibling, parent, grandparent, step-parent, step-children and step-siblings) and those living in their same households are ineligible to participate in this Sweepstakes. By participating in this Sweepstakes, each Participant, (a) accepts the terms and conditions stated in these Official Rules, (b) agrees to be bound by these Official Rules and by the decisions of HomeSmart ICARE Realty, which are final and binding in all respects, and (c) warrants that he/she is eligible to participate in this Sweepstakes. ODDS OF WINNING: Odds of winning are determined by and depend upon the total number of eligible entries received. No limit on chances available per person. PRIZE: The prize will be awarded subject to these rules. 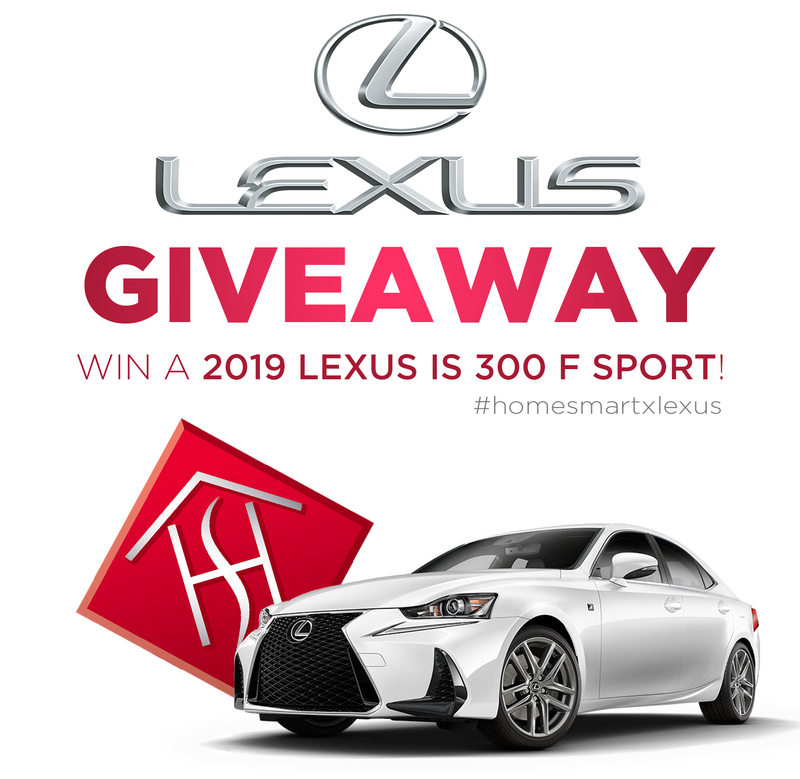 One (1) Prize Winner will receive two (2) years paid (courtesy of HomeSmart ICARE Realty) lease on a: 2019 Lexus IS 300 F Sport provided by Lexus of Sacramento. The approximate retail value of the vehicle is $ $44,630 USD. PRIZE CONDITIONS & RESTRICTIONS: Potential winner must take delivery of the prize no earlier than December 13th, 2019 and no later than December 31, 2019 at Lexus of Sacramento, 2600 Fulton Avenue, Sacramento, CA, 95821 US or prize will be forfeited. The winner will be solely responsible for all federal, state and local taxes, registration, license, title and insurance fees and for all costs and expenses associated with acceptance, taking delivery of and/or use of all elements of the prize, in whole or in part, not specified herein, including but not limited to all taxes, fees, insurance, travel costs and expenses, shipping costs and/or any other expenses associated with acceptance, use of and/or taking delivery of the prize. Potential winner is solely and exclusively responsible for possessing a current, valid driver’s license , and proof of liability insurance before taking possession and delivery of prize.HOMESMART ICARE REALTY SHALL HAVE NO RESPONSIBILITY OR LIABILITY TO A WINNER OR POTENTIAL WINNER WHO IS UNABLE OR UNAVAILABLE TO ACCEPT OR UTILIZE THE PRIZE, IN WHOLE OR IN PART. HomeSmart ICARE Realty will be covering the amount of miles specified by the lease, and is NOT responsible for any fees incurred for exceeding the number of miles allowed by lease. PRIZE AWARDING; WINNER ANNOUNCEMENT: The potential winner and prize award is subject to verification and will be awarded only upon validation and verification by HomeSmart ICARE Realty. The potential prize winner will be chosen by random drawing on or about December 20th, 2019 at HomeSmart ICARE Realty's Holiday Party and notified that evening from all eligible entries received. The potential winner will be notified immediately for the winner to drive the Lexus off the lot. No substitution, transfer, or assignment of the prize will be permitted, except that HomeSmart ICARE Realty reserves the right, in its sole discretion, to substitute the prize with either the cash value of the prize that would have been awarded, or a prize of equal or greater value. The prize may not be combined with any other offer. IF THE POTENTIAL PRIZE WINNER IS NOT PRESENT AT THE EVENT (date to be determined), THE POTENTIAL WINNER WILL BE INELIGIBLE AND ANOTHER ELIGIBLE NAME WILL BE DRAWN. The car will be available to winning agent through 2020 & 2021. The vehicle will be under a 2 year lease, paid for by HomeSmart ICARE Realty. The vehicle stays with the Company, thus if you leave HomeSmart ICARE Realty for any reason, the car must be returned to the Company.